As a nature photographer, there are some surprising discoveries to those that keep a vigil watch on their surroundings. I have found that the more I slow down and really take my time then nature begins to show itself. After a while it’s certain that you’ll take a deep breath and embrace the relaxation that results from slow observation. Along with the forced relaxation — yes as an American we like to go-go-go, and do-do-do, your connection with nature begins to form. A sense of unity of with your natural surroundings will support a mindful awareness. Being in the moment, experiencing the place and time you’re at instead of thinking of the past or worrying about the future. It’s this mindful awareness that makes you feel more grounded in your spirit, your energy quietened from the busy and directed to discovery. And in this state of mind is when creativity begins to emerge. You’ll start to see the magic in nature and finding ways to capture it to share your experience with others will be easier. One lesson I learned as a horseback rider is to develop a “Soft Eye.” A Soft Eye is when you move away from focusing your attention and eyes to just one specific thing, but rather to soften your gaze and see everything in your line of sight. A soft eye isn’t an intense gaze like a “Strong Eye” that directs all your energy to your subject and they feel it. Believe me..they feel it. Many times when looking at my wildlife subject I gaze away. I make sure I’m not staring right at the bird or animal, and I most certain try to avoid eye contact. Get eye contact and BAM ! Off the critter goes..well…lots of times that is. Yesterday I had the privilege of seeing some rather unusual things not seen before. 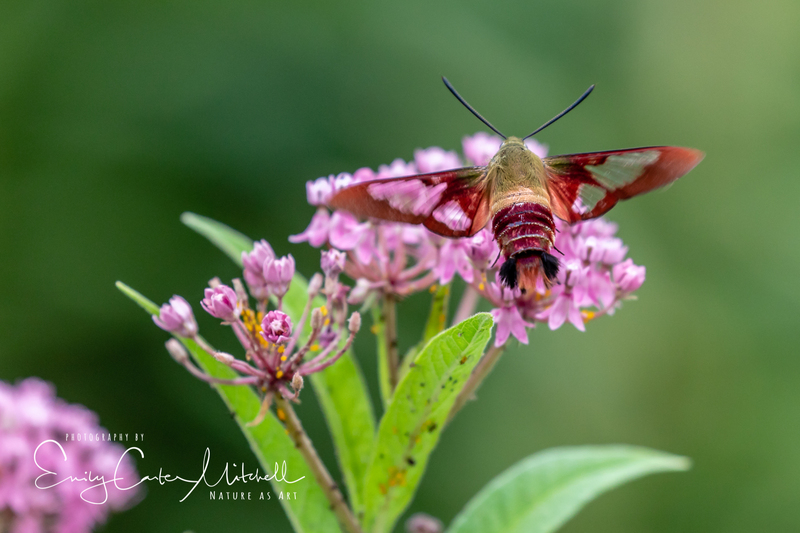 The Clear winged hummingbird moths have come out in full force, along with the native butterflies and seeing them enjoy pollinator plants at a nearby wildlife refuge was a true pleasure. Using a telephoto lens, I’m able to capture them without scaring them off. 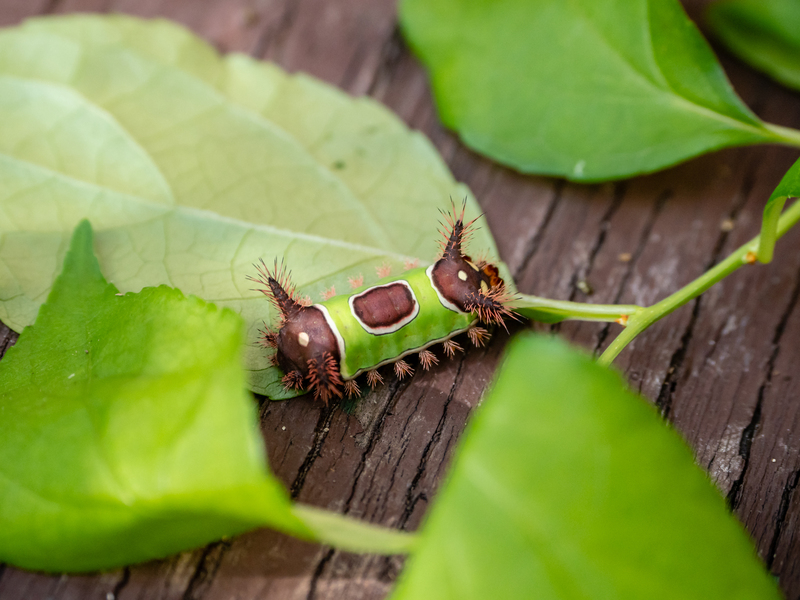 The Saddleback caterpillar is one several of my nature photographer friends have been able to find the last couple of years. Truly, I have no idea how these bug photographers find the bugs they find so I’m always amazed about the variety that is seen. The volunteer gardener at the refuge discovered this one and brought it over to me to share and of course, grab a picture of it. It emerges as the Saddleback moth that is rather alien looking. At home, I’m always looking outside when I go about my to-do’s. Surprisingly I have a new guest in the garden and this is a silver version of the Eastern Gray Squirrel. It is a rather uncommon color and only once before have I seen a squirrel like this and it was back in March in Pennsylvania. I’m hoping he joins the rest of the Buddha squirrel family that has found the manor a bountiful place to live. Only time will tell. 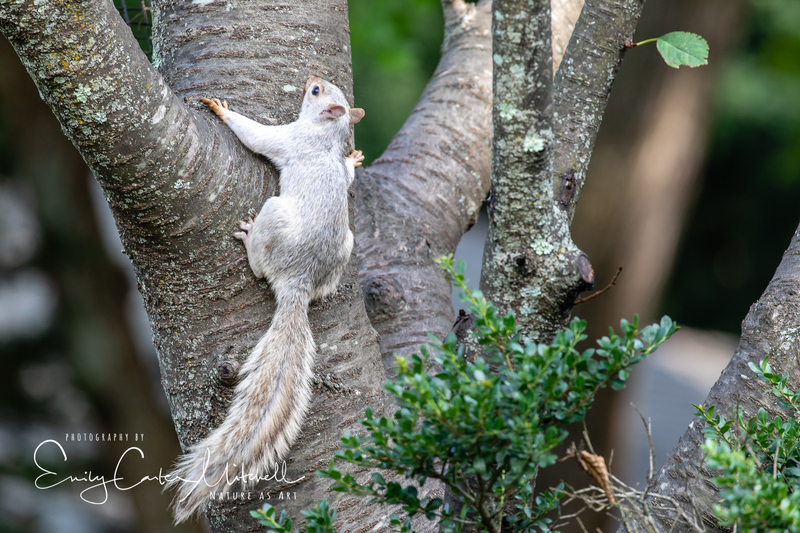 As to white squirrels: tere’s a colony of them in Brevard/NC. Wow, that is super to hear Pit. This one is silver though and different. He is still a Eastern Gray squirrel though. Thanks! Once I get to describing that day in my blog about our recent road trip, I’ll show a picture or two.